The interface of archelios Calc™ was carefully studied to quickly size installations of any type, from the simplest to the most complex. 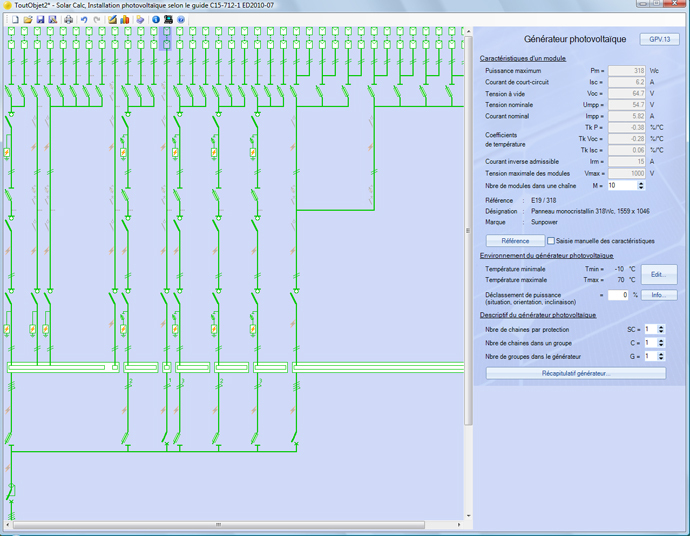 An individual input of technical characteristics of an element or an input in multi-selection by a simple drag-drop (for example, the length and the laying mode of a whole cables). At all level in the synoptic, it is possible to copy-paste, duplicate, insert elements. Each duplicated element can be edited to be modified. The simple overview of a component in the diagram allows the display of its technical characteristics. Any modification on an element leads to an automatic check on the whole installation: the non-compliant section then appears in red in the synoptic. A visual description of a section in the synoptic brings an assistance to the conception and to thephotovoltaic sizing: in red, the anomalies; in black, the incomplete information; in orange, a borderline element compared with the calculation criteria. The protections: calculation of the sizes, power cut, thermal and magnetic thresholds, etc. The cables: current of use, laying mode, demanded maximal reduction in voltage, etc. The lightning arresters: automatically defined characteristics, control of protections which are associated to them. Export your diagrams to the AutoCAD® format (DWG).